The ASA Could Use A Little Liposuction. If anybody wanted to know why the American Society of Anesthesiologists needs an enormous new headquarters building, part of the answer was revealed by the former ASA president himself. In the March issue of the ASA Newsletter, John Zerwas, MD, the immediate former president of the group wrote a piece praising the number of anesthesiologists who volunteer to work with the ASA. Titled "ASA Exceptionalism," Dr. Zerwas gives a heartfelt thanks to all the people who help run the organization. He writes that there are 100 committees in the ASA with over 1,500 anesthesiologists working in these groups. 1. CRNA's and the states that are opting out of physician supervision. 2. The VA's proposal to allow CRNA's to practice independently. 3. Medicare's low reimbursement for anesthesia services. 6. Insurance denial of payments for GI anesthesia. 7. Attracting bright medical students to choose anesthesiology. 8. The abuse of the Company Model for anesthesia services. 9. Publicizing the patient safety advances made by anesthesiologists to the media. 10. Improving the swag handed out at the ASA annual meeting to increase turnout. Okay so this sounds pretty simple but it was the best I could do at the spur of the moment. I'm sure there are a few more legitimate matters that should be addressed by the ASA. But ninety more? I doubt it. After awhile, committees create their own problems to justify their existence. Then they need to increase their annual budgets to prove they are working on grander issues than their original intent. Like Congress, once a committee is set up, it is rarely phased out. So instead of praising the large number of people who work at the ASA, how about the leadership downsize a bit and concentrate on a few core issues that affect us plebes down here in the trenches. I think they would find that the membership will be more responsive to real problems than to a committee that investigates romantic relationships in the operating room (warning: gross out kissing pictured if you follow the link). Is Anesthesiology Losing Its Cachet? Another Match Day has come and gone. We are finally getting some details on the results of Match Day of 2014. The NRMP crowed about the increasing number of U.S. medical school graduates matching into primary care. They highlighted in their press release that more than 3,000 seniors had decided to go into Internal Medicine. Never mind that most of these folks will probably move on to a more lucrative subspecialty once their residency is completed. Despite this laudatory statistic, less than half, 48.5% to be specific, of all Internal Medicine spots were filled by U.S. graduates, the rest presumably taken mostly by foreign medical graduates. The same dismal numbers are found in Family Medicine (45%), Psychiatry (51.8%), and Prelim General Surgery (38.1%). If the match rate is an indication of the popularity of a field, then subspecialties like Dermatology, Neurology, Orthopedic Surgery, and Neurosurgery are still the most desired by U.S. medical students, each with nearly 100% fill rate. Overall, 61.5% of all PGY 1 spots were filled by U.S. graduates. How did anesthesiology do? At least we can say we did better than average. For 2014, 71.9% PGY 1 spots were filled by U.S. seniors. It was the ninth most popular field ranked by the students, falling just behind OB/GYN. But if you look at the trend over the last few years, the numbers are starting to look troubling. The 71.9% is the smallest percentage filled since at least 2010, the last year published in the NRMP press release. This follows a drop last year to 74.8% from 78.9% in 2012. In 2011, 79.8% of all PGY 1 spots were taken by U.S. seniors. Is it because we are now reaching a saturation point in the number of anesthesia residencies being offered? This year 1,049 positions were offered, with 754 successfully filled with American students. In 2010, just 797 spots were available which were taken by 626 lucky seniors. So the number of positions has expanded dramatically while the take rate has grown to a lesser degree. Other fields that are highly sought after have kept the number of residency positions level or even decreased despite the clamoring for spots. Dermatology went from 31 in 2010 to just 20 this year, making it even more desirable like a rare commodity. Neurosurgery went from 191 five years ago to 206 today, a barely perceptible increase of 7.9%. Orthopedics stayed fairly stable from 656 to 695, or 5.9%. What did anesthesiology department heads do? They increased the number of positions available by 31.6% in five years. That rate of growth is clearly not sustainable and will take time to absorb. Perhaps all the talk about the encroachment of CRNA's into the profession is scaring away potential anesthesia candidates? That sounds like a pretty defeatist attitude for the next generation of anesthesiologists. But a quick glance through the Student Doctor Network will quickly demonstrate the anxiety facing medical students who are thinking about going into anesthesiology. I get emails routinely from nervous medical students asking me for my prognosis on the future of anesthesiology. All I can tell them is that statistically there is still a shortage of anesthesiologists in this country, particularly away from large cities and the coasts. Will CRNA's overrun our field with their cheap labor? Not if we're smart and organized like them and contribute to PAC's like the ASAPAC to help get our voices heard in the halls of Congress. What is our leadership at the ASA doing to prevent an exodus of bright medical graduates from going into something else? I don't know but they better get their heads out of their butts and start doing something more constructive besides building a new headquarters for their bloated bureaucracy. Remember that sad and sordid story a few months ago about Jahi McMath? She was the 13 year old girl who died from an anoxic brain injury after surgery to treat her sleep apnea. She was pronounced brain dead by multiple pediatric neurologists last December. However a sympathetic judge sided with the family who believed she will one day wake up from the catastrophic surgical complication. The judge allowed the the family to keep the body on a ventilator and let them move her to an undisclosed location. Apparently this fantasy has not played itself out yet. Yesterday, Jahi's mother, Nailah Winkfield, told a local TV station that Jahi was "still sleeping." Says Ms. Winkfield, "She is blossoming into a teenager before my eyes." Never mind that the poor girl's brain is now a protein mush while her internal organs slowly and inevitably shut down. The only thing keeping her heart pumping is the ventilator that is forcing air into the lungs. What is really disturbing to me is that Ms. Winkfield was actually being "honored" for her delusional attempts to save Jahi by the Terri Schiavo Life & Hope Network in Philadelphia. They wanted to praise the family for "protecting the dignity of a loved one against overwhelming odds." Says Bobby Schindler, Terri's younger brother, "Jahi's family persevered through extreme pressure from doctors, media, and public opinion to enable their child a chance to be properly cared for." Is there any worse way to dishonor the memories of Terri Schiavo? I guess the people who run this network don't recognize the difference between persistent vegetative state and brain death. When somebody is in a persistent vegetative state, which is what Terri was in, their brain is still alive. It's just in a coma but can have a very slim chance of waking up. Brain death means dead. You would think that after her family struggled through years of heartbreak and legal fighting to keep her alive, they would understand the difference between brain death and persistent vegetative state. Apparently they didn't learn anything despite years of legal arguments about the medical definitions of life, death, and PVS. To equate Jahi's condition, and her family's fantasies, to Terri's medical state is the ultimate affront to her memory and cause. This Sunday, March 30th, is Doctor's Day. Since it falls on a weekend this year, our hospital decided to show its appreciation for us by sending two big boxes of doughnuts and pastries to the nursing break room. Obviously they couldn't put them into the operating rooms where the doctors could actually get to them. Luckily for me I had a late start today and was present when the gifts were brought in. Needless to say, by the time the anesthesiologists and surgeons, you know, the hard working DOCTORS, got out of their rooms after completing the first cases of the day, most of the goodies were gone. Well, I suppose it's the thought that counts. City Workers Get Pay Raises While Doctors Settle For A Pay Freeze. What Is Wrong With This Picture? I've been getting bombarded with emails from the AMA urging me to contact my Congressman to pass a bill to eliminate the SGR once and for all. This will finally get rid of the annual games Congress plays with physician incomes in which the SGR formula calls for draconian cuts in Medicare reimbursement only to be rescued by the legislature at the last minute. Unfortunately, the fix to the doc fix may be worse than if nothing is done. At least when we had the doc fix, Congress usually slips in about a 1% raise in reimbursements each time. With the new bill, reimbursements will rise 0.5% every year for five years followed by a pay freeze for the next five. With medical inflation easily running at least 4-5x that number, it's easy to see how doctors' incomes will be drastically curtailed in ten years on an inflation adjusted basis. So the AMA wants me to call my representatives in Washington to support a bill that will cut my income over the next decade? I didn't know Chicago already allowed medical marijuana to be used at the AMA's headquarters. Is it any wonder that only a quarter of the nation's physicians belong to the AMA? With friends like this, we might as well buddy up to the trial lawyers who have the real power in Washington. What about my own society, the ASA? Well, true to their gutless selves, they are taking no stand on this issue. They are taking no action to prevent my income from being reduced by half over the next decade. Thanks for nothing. I guess they are too busy over there in Schaumburg erecting their new headquarters with my annual membership fee. In the meantime my local city union workers are getting a six percent raise in their salaries this year. If the laws of supply and demand were truly in effect, it should be the doctors who are getting the raises as there is a constant harping about the severe shortage of physicians in this country. The city workers, who we all have seen barely lifting a finger to help anybody, should be the ones getting right sized. This again shows how powerless physicians are in creating their own destinies. We are at the mercy of representatives who pay far more attention to lawyers and city unions than the people who will be taking care of their mothers in the hospital. KevinMD Headlines That Make Me Want To Go Ugh. I love the KevinMD blog. It gathers up medical opinions from all over the web and makes it easy for me to read different points of view from fields like IM, Emergency Medicine, Surgery, etc. But sometimes the headlines it present are so saccharine and self important that it makes my skin crawl and my eyes roll. The following is just a brief list of blog posts on KevinMD that were written in the past few months that made me throw up a little in my mouth. Be Emotionally Intimate With Your Patients. Sympathy Is The Missing Art In Medicine. Compassion Is What Connects Us All. Through Our Patients We Find Ourselves. My Cancer Shows How Our World Is Ruled By Love. Seriously, these are actual titles on KevinMD. Now this is no way a commentary on the contents of these posts. In fact, with names like these, I usually don't bother reading the articles. I don't need a lecture on how my cynicism is keeping me from connecting to my patients. I also didn't bother to link the titles to the actual posts in the blog. I figure if headlines like this float your boat you can figure out how to find the articles yourself. So if you haven't done so already, head on over to KevinMD to read some very good op ed pieces on the state of today's healthcare system. Just make sure you have an emesis basin handy in case you feel that nasty reflux creeping up your esophagus as you peruse some of the blog posts. I Heart Etomidate. And That's Alright. I love etomidate. As our patient population gets older and sicker, I find myself using that drug more and more frequently. Unlike propofol, etomidate helps to maintain cardiac output and normal blood pressure upon induction. But we've been warned since residency that etomidate causes adrenal insufficiency and could potentially lead to an Addisonian crisis. Because of that, I've always been leery of administering the drug, with that caveat constantly in the back of my mind. Now there is a new study that says it's okay to give etomidate for induction. In this month's issue of Anesthesiology, researchers from Vanderbilt University retrospectively examined over 3,000 patients undergoing cardiac surgery from 2007 to 2009. During that period, 62% were given etomidate as the induction drug. The study showed that etomidate was not associated with more hypotension, longer mechanical ventilation, longer hospital stay, or increased mortality. Even though this study was based only on cardiac surgery patients, I find that the information will be useful for my every day practice. Many cardiac patients, with ejection fractions of 30% or lower, sometimes much lower, now undergo noncardiac procedures, like GI endoscopy, angiograms, pacemaker and defibrillator implants, and just plain old general surgery. As the life expectancy of heart patients increases with the use of devices like ICD's, ventricular assist devices, and even artificial heart implants, expect to see more of these tricky cases on the OR schedule for routine procedures like hernia repairs or lap chole's. Etomidate could become your new best pharmaceutical friend. Why Is It Lawyers Can Dump Their Clients And Doctors Can't? Remember the case of Michael Dunn, the white Florida man who shot a van full of black teenagers because they wouldn't turn their music down? He was later convicted of attempted murder on three of the teens but the jury could not decide on a verdict for first degree murder in the shooting death of Jordan Davis. Mr. Dunn was originally supposed to start his new trial in May. But now the Florida judge has postponed that trial for the remaining charge of first degree murder. The new trial may not take place until much later this year because apparently Mr. Dunn could no longer afford his attorney from his first case and has to start all over again with a new lawyer that is probably a public defender or working pro bono. Hmm. A man's fate is in the lawyer's hands but he punts his client to somebody else because the client can't pay the fees. In medicine that is called patient dumping which is highly frowned upon. As doctors, we have to treat all patients regardless of ability to pay. This man's life could be on the line, just like many of our patients, but it seems like lawyers can dump their clients with impunity. The original lawyer was probably the best one to continue the case since he has already gone through one trial and knows all the details intimately. Now a second lawyer has to come in and review all the records and try to understand what the first lawyer was doing. We know how frustrating it can be when we get patients transferred from another hospital and try to decipher the reasons why certain tests were performed and why some things were overlooked. It is never as smooth as if the originial caregiver continued the case. So good look Mr. Dunn on your new lawyers. You're going to need it. Yes, even the LA Police Department has gone Hollywood. 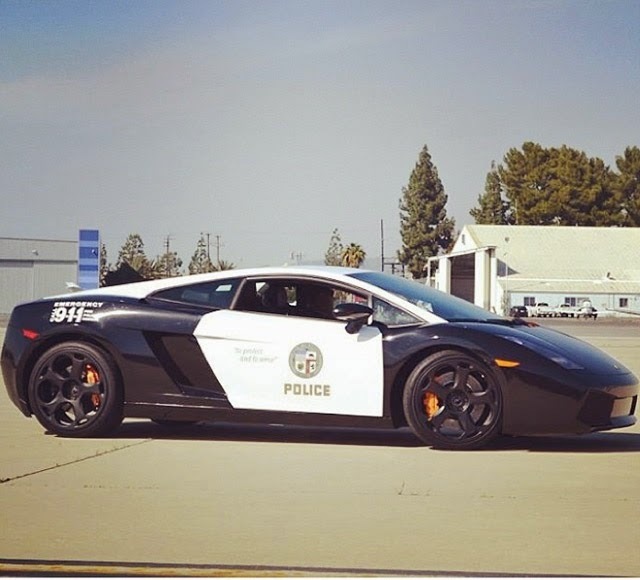 Check out LAPD's Lamborghini. They don't just patrol with Crown Vics around here. Wouldn't want our fine men in blue to be confused with those from smaller burgs like, um, Bakersfield. More pictures here. I was sleeping soundly at home while on call when my pager went off a 1:30 AM. The hospital said I needed to come in for an emergency surgery for an ischemic limb. Grumbling, I quickly dressed into my scrubs and hightailed it into the hospital, knowing that there is a limited amount of time to save a limb from dying due to a lack of blood circulation. I quickly set up my room then went to preop to talk to my patient. There, I saw on the gurney an anxious looking elderly woman holding her leg while her husband stood faithfully by her side. Trying to sound cheerful and optimistic despite having just been awoken twenty minutes ago, I introduced myself, "Good morning! I'm Dr. Z. I'm here to help save your leg!" Probably not the smoothest introduction I could have made, but at 2:00 in the morning that was the best I could muster. However that lack of subtlety was not well received. The patient stared back at me in shock and retorted, "What do you mean 'save my leg?'" The husband looked at me disapprovingly. Uh oh. This was not going well. I tried to clarify myself, "Well, the surgeon says there is not enough blood flowing down to your leg so we need to fix that to keep it viable." That explanation also was not to her liking. "So you're saying I could lose my leg?" she cried through her sobs. "The surgeon never said I could lose my leg!" I was starting to wonder how the surgeon was able to get a consent for this operation if he didn't explain all the risks and benefits of this emergency surgery that was keeping all of us up at 2:00 AM. Finally the surgeon, who I have worked with for many years and greatly admired his skills, walked in. Gruffly, he asked if we were ready to get started. The patient verbally lunged at him and asked why did I say she might lose her leg. That was never explained to her. The surgeon quickly plunged a knife in my back and said, "I never said you would lose your leg. I explained to you that we needed to restore blood flow to your leg to make it better." I can see I was getting thrown under the bus tonight. Not wanting to escalate the tension, I backed out of the room while they hashed out the consent. From my side of the doorway, I could hear the patient ask the surgeon, "Is that anesthesiologist any good?" So now my professional integrity was in question for daring to give the patient a complete picture of her medical emergency. At least the surgeon had some esprit de corps left in him and answered in the affirmative, that we had been working together for many years and that I was an excellent anesthesiologist. As the circulating nurse wheeled the patient to the operating room. the husband started to dress me down. "You didn't have to tell her she could lose her leg." By then I was in no mood to make nice talk to anybody anymore. I quickly shot back, "Well sometimes the truth can hurt," and walked away. 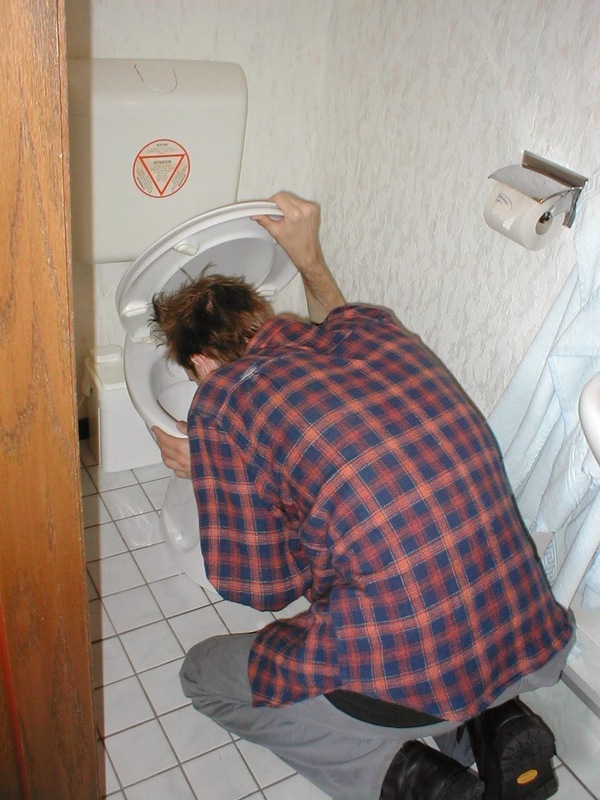 When I look back on the events of that night, I have to admit it was not my finest moment. In fact it was one of the worst. Well, that's what happens when doctors are not truthful to their patients in a misguided attempt to sooth their fears. If the surgeon had given a truly complete informed consent, the patient and her family would have understood the gravity of the situation and why we were all gathered there in the wee hours of the morning. It wouldn't have been sprung upon them by a straight talking sleep deprived anesthesiologist. Indulge me for a few minutes while I rant about something not related to medicine. I recently upgraded my iPhone's operating system to iOS 7.1, just like most Apple lemmings, I mean loyalists, do when they get their friendly reminder from the company to do so. The upgrade went without a hitch, as they usually do. There are a few cosmetic changes that are neither here nor there in relevance to my daily use. However, when I checked my Calendar, there was a huge surprise in store, and not in a good way like Christmas or birthday surprises. Anybody who uses the Calendar app on the iPhone knows that days that have appointments are marked with a little dot on the monthly view. I usually keep my call schedule on the Calendar. But when I opened up Calendar after the upgrade, I suddenly noticed a bunch of new little dots that were not there before. Curious, I zoomed in to the daily view and this is what I found. Apple has kindly filled in my calendar, without asking for any permission, with events it thought I might find important. As you can see from the screen shot above, the company thought I would want to know when Earth Day is this year. Dear Apple, I do not need or want to know when Earth Day is. I know your company and employees consider yourselves all progressive and environmentally friendly. But my kids will be bringing plenty of propaganda home from school on that day to remind our family what wasteful heathens we are for not recycling every little scrap of paper and plastic in the trash bag. I don't need my phone to nag me about the same thing. Apple also thought I might want a reminder on my calendar about when Cinco de Mayo occurs. Hello!! The name of that day is also the date on the calendar. I do not need a reminder on May 5th that that day is Cinco de Mayo in Spanish. They also thoughtfully filled in Christian themed holidays for me. That is a total intrusion of privacy and I do not appreciate them pushing a religion on my phone. What if I celebrate Rosh Hashanah? Somehow that day hasn't been placed into my calendar. What if I observe Ramadan? That also wasn't approved by Apple as an official holiday to push at its users without permission. As a liberal left wing corporation, Apple should know better than to push religion on anybody. Do their Calendar app people work out of Texas? So Apple, please do another upgrade soon so that these corporate preapproved holidays and events are removed. They are a distraction when I need to check my calendar for an appointment and a total invasion of privacy. I don't need to know when Flag Day is in the year 2015. That's the lament being heard with increasing frequency among primary care physicians. Sermo surveyed its physician users on how likely they would choose their own specialty again if they had to start all over. The results should come as no surprise. 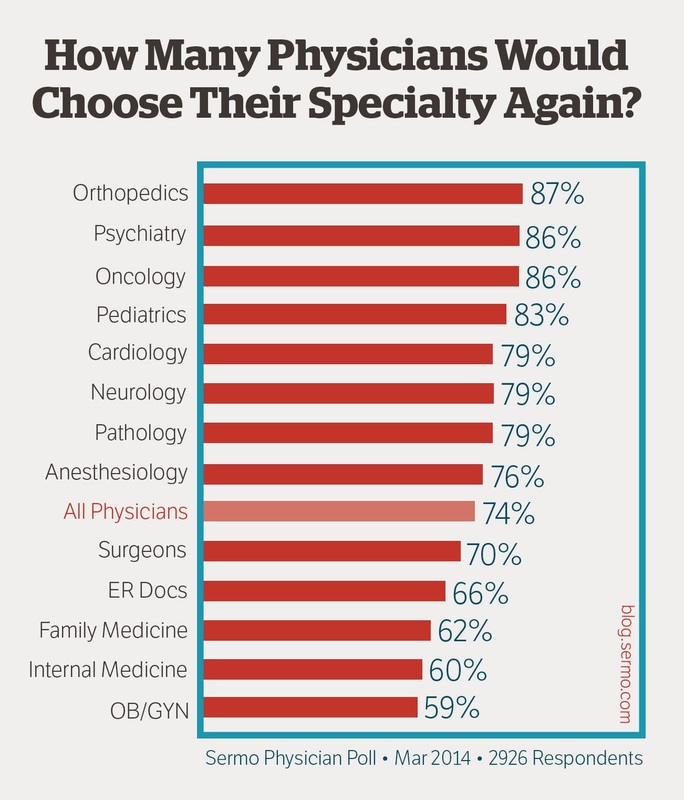 Out of nearly 3,000 doctors who answered the survey, on average 74% would choose their own specialty again. However, bringing up the bottom were--OB/GYN and Internal Medicine. Only 60% or less of those doctors would choose the same jobs. This was followed closely by Family Medicine, with 62%. At the top of the job satisfaction list is Orthopedic surgeons, where 87% would choose the same specialty. This is followed by Psychiatry and Oncology, both in the mid 80% range. Anesthesiologists answered with a collective "meh." We were nearly the average of all doctors, with 76% saying they would choose the same field. Surgeons are just below average, with 70% choosing to stay the course. The results somehow aren't all that surprising. We all know about the terrible stress afflicting the primary care doctors. Reimbursements are terrible. There will soon be a flood of patients needing their services but whose insurance pay Medicaid rates. Their student loans are no less than doctors who go into anesthesiology or orthopedics or gastroenterology. So why get saddled with a six figure debt that's not even your home mortgage working for an income that's as little as 20% of their fellow classmates who chose to go into a procedure intensive field? These are the questions that many medical students and residents are asking themselves right now. Vaping Vs. Toking. The Politically Correct Choice. The Los Angeles City Council last Wednesday voted to treat the newly trendy electronic cigarettes the same way tobacco cigarettes are treated: no smoking allowed inside restaurants, bars, or workplaces. Their justification is that vaping, the term for using an e-cigarette, has not been studied well enough to understand the long term effects of the second hand water vapor that emanates from these devices on the health of innocent bystanders. Plus they fear that the nicotine in e-cigs might lead the user into using the real tobacco product so they must protect the public for its own good. Frankly I don't advocate anybody putting any flaming substance to their lips and inhaling. But I can't applaud the City Council's actions when I consider their perverse embrace of marijuana dispensaries dotting the landscape all around LA. While e-cigs are legal devices, medical marijuana, with a couple of exemptions, are illegal in most states and throughout the country under federal law. Yet members of the Council have made impassioned pleas for marijuana shops to be allowed to operate without excessive regulation. This embrace of the still unauthorized marijuana reaches all the way up to the top of this left wing presidential administration. The country's number one law enforcer, U.S. Attorney General Eric Holder, is even giving advice to banks on how to work with marijuana dispensaries in the hope that these businesses, wink wink, can become more successful. All this love for marijuana seems misplaced. While tobacco smoking has been linked to lung cancer, smoking marijuana can lead to respiratory illnesses too. Tokers are placing burning plant leaves into their lips and mouths, inhaling the smoke just like cigarettes. Consequently particulate substances reach down into the lungs the same way tobacco particles do. Don't tell me marijuana leaf particles are somehow more benign than tobacco. The City Council's concerns regarding the potential addictive qualities of the nicotine in e-cigs also doesn't jibe when they dismiss the addictive nature of marijuana. The reason pot users need to toke every day is because of their addiction, not because of their glaucomas. I can understand why the city government is advocating for a banned substance while shutting down the use of a legal one. Most of these members probably have used pot in the past. They're mostly of the baby boomer generation who flauted laws as a matter of pride. Drug culture became their culture. That's why before every concert and ball game there is a public service announcement saying no smoking is allowed but everybody starts lighting up their pot as soon as the event begins. Yet there isn't a bouncer in sight who will throw out a pot user but if somebody lights up a tobacco cigarette there would be mass hysteria to get the user kick out. And no, not all of us enjoy the second hand smoke from marijuana. So while it's good and well that the LA City Council members are looking after the welfare of e-cigarette users by attempting to keep them off the nicotine dispensing devices, their words would carry more weight and appear less hypocritical if they also embraced the fact the marijuana can be equally harmful. Plus what part of ILLEGAL don't they understand?